308 pages | 6 B/W Illus. This volume chronicles the development of communication studies as a discipline, providing a history of the field and identifying opportunities for future growth. Editors Pat J. Gehrke and William M. Keith have assembled an exceptional list of communication scholars who, in the thirteen chapters contained in this book, cover the breadth and depth of the field. Organized around themes and concepts that have enduring historical significance and wide appeal across numerous subfields of communication, A Century of Communication Studies bridges research and pedagogy, addressing themes that connect classroom practice and publication. 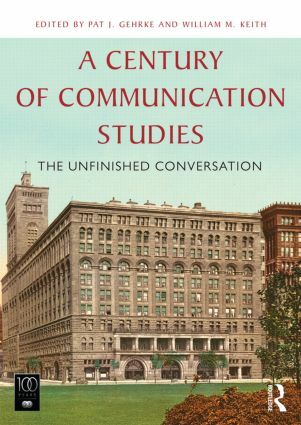 Published in the 100th anniversary year of the National Communication Association, this collection highlights the evolution of communication studies and will serve future generations of scholars as a window into not only our past but also the field’s collective possibilities. Liberalism and its Discontents: Black Rhetoric and the Cultural Transformation of Rhetorical Studies in the 20th Century. Pat J. Gehrke is Associate Professor of Speech Communication & Rhetoric at the University of South Carolina. His research interests include the history of communication education, rhetorical theory, communication ethicsm and public political discourse. William M. Keith is professor of Communication at the Univesrity of Wisconsin Milwaukee. His research interests include the history of public particpation in the United States, communication pedagogy and disciplinarity, and the rhetoric of science.